Rosewood Woodies Caterpillar for Small Animals offers small animals a fun toy that provides both mental and physical stimulation as well as promoting good oral health. Rabbits, guinea pigs, hamsters and other small animals can enjoy hours of fun chewing and playing with this pet-safe toy. 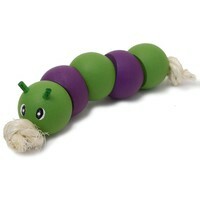 This wooden caterpillar is ideal for helping small animals keep their teeth trim and strong. Smaller than the advertised 9.5cm and all three of my guinea pigs couldn't show any less uninterest in this you if they tried. Wish I read the reviews before buying as I wouldn't have purchased it. It's just used as cage "decoration". Smaller than I thought it would be. Although I hope it lasts longer with just the one rabbit, I can imagine it would be pretty easy to break with some rough playing. Cute, but my guinea pigs weren't keen on this toy at all, I don't think they even touched it! Not a very good product as it didn't last for more than five minutes with my three rabbits. They chewed the knot off the end and the wooden balls fell off. The balls were then too small for them to do anything with them.